The SAT – officially known as the SAT Reasoning Test (formerly called the Scholastic Aptitude Test and the Scholastic Assessment Test; now the letters "SAT" don't stand for anything!) – is a 3¾-hour standardized test for admission to universities in the USA. The SAT is owned by the College Board and developed/administered by Educational Testing Service, where Judi Robinovitz, founder of Score At The Top, worked for 23 years. The SAT measures reading, math, and writing abilities important for academic success in college and beyond. It is designed to help predict how well a student can expect to do academically in the first year of college. The SAT was originally developed by Princeton psychologist Carl Brigham in the early 1920s, and has its roots in IQ testing. It was created as a response to a growing desire by American educators, led by Harvard president James Bryant Conant, to open their universities to the best students in the country. The ACT, the other college-admissions test, was originally conceived as an examination of achievement. Historically, the SAT had been more popular among colleges on the East and West Coasts and the ACT more popular in the Midwest and South. However, all that has changed, as the two tests are now equally accepted by all colleges that require standardized test scores for admission. In fact, there are a number of high-profile colleges that will accept just the ACT in place of a combination of SAT Reasoning and Subject Tests. How is the SAT organized and scored? In addition to the Total Score (the sum of the above two), the remaining dozen “insight” scores may be used by colleges and you to better understand your capabilities. If you take the optional SAT Essay Test, your essay is read by two readers, each of whom scores it in three areas, Reading, Writing, and Analysis. 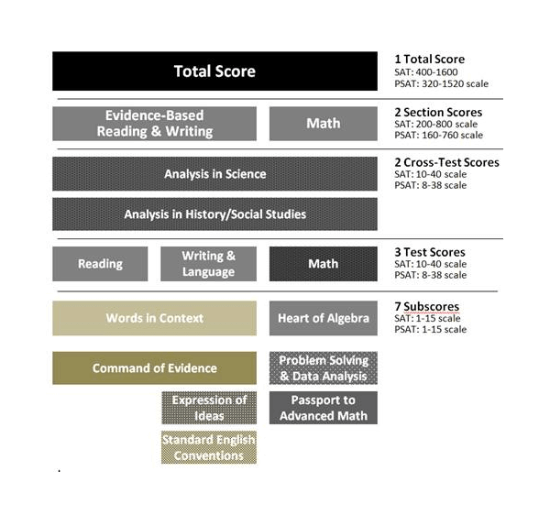 Reader scores in each area are added together to yield three essay scores on a scale of 2-8. Each SAT has three unique score conversion tables created for it ― tables that convert the number of questions you get right into the various SAT scores and subscores. Each set of conversion tables reflects the difficulty level of the questions on its associated test; it’s like saying the SAT is graded on a curve. If one test is slightly harder than another, the harder test will be scored slightly more leniently ― and conversely. Because the conversion tables are different from test to test, it’s impossible to say exactly how many questions you need to get right to get a particular score. How is the SAT used in college admissions? For the majority of colleges, the SAT (or ACT) score is the second most important factor in college admissions, second only to the combination of a student's curriculum and grades throughout high school. Among the roughly 800 colleges that do not require a test score for admission, only about three dozen are selective liberal arts colleges (e.g., Bates, Bowdoin, Holy Cross, Franklin & Marshall, Mount Holyoke, Rollins, Sarah Lawrence, Wake Forest, to name a few). Chances are that most students will apply to colleges where test scores are vital to the admissions process. And several of these test-optional colleges require a test score for scholarship consideration. If a student chooses to report SAT scores rather than ACT scores when applying to college, he or she must contact College Board (www.collegeboard.com) to send an official score report to each college (unless the student already did that when registering for the test). However, sending the "right" SAT score report can be tricky because of "Score Choice," introduced by the College Board in March, 2009. Although Score Choice was designed to reduce student anxiety by allowing students to choose which sets of SAT scores to send to colleges, some colleges didn't see it the same way. These colleges have chosen not to honor Score Choice, thus requiring students to send a full score report containing scores from all SATs taken in high school. Before sending an official score report to each college, students should check with those colleges to find out whether or not they honor Score Choice. Regardless of a college's Score Choice policy, virtually all colleges "super score" the SAT: they select the best reading, math, writing, and essay score from all submitted scores. By contrast, the ACT score report contains a single set of scores. Thus, the ACT is more of a risk-free test than the SAT since the student selects the single score set to appear on the official score report, automatically suppressing unwanted scores. There are, however, a few colleges that request all ACT scores and even some colleges that "super score" the ACT. Calling colleges is the best way to understand how they evaluate ACT scores. The SAT (and ACT) scores are used for more than just college admissions. They may be used to help determine financial aid, scholarships (like Florida's Bright Futures), admission into honors programs, and placement in freshman courses. How do colleges use the SAT writing & essay scores? Interestingly, some colleges, like Georgetown, do not use the essay score at all! In any case, it is important for students to master the skills necessary to do their best on the essay portion of the test since writing is a vital skill for college and beyond. And remember: all colleges will receive the essay score if you took the essay test, even if they say they don't use it. When should my child start preparing for the SAT? How much test-prep is needed? Effective SAT preparation should begin the summer after tenth grade – and continue until a student has taken his or her final SAT. There is no limit to the number of times a student may take the SAT, but he or she should prepare for each one or risk diminishing results. However, since some colleges insist that students send all their scores, we typically recommend taking the SAT no more than three times – and only when well prepared. How much of an SAT score gain can be expected? Most students take their first SAT as second-semester juniors. On average, for the SAT administered before March 2015, these students scored a total of 40-50 points higher on the combined reading and math sections of this SAT than on the corresponding sections of their junior PSAT; they tended to gain a total of 30 points on these sections of their senior SAT. However, some students got lower scores; in fact, 1% of test-takers dropped by 100 points or more in reading and math combined! Most students who seriously prepared for the pre-March 2015 SAT with Score At The Top had significant score gains of 150+ points combined in reading, math, and writing – at least three times the national average score gain. And some of our motivated students enjoyed gains of well over 300 points! Here's the "double-edged sword": some of our students achieved such impressive score gains that they were challenged by the College Board and had to re-take the test to prove the legitimacy of their higher scores! While the results above reflect score gains we have observed, we do not guarantee score gains. The SAT introduced in March 2015 is still too new to provide meaningful score-gain data for students who have taken the redesigned SAT.